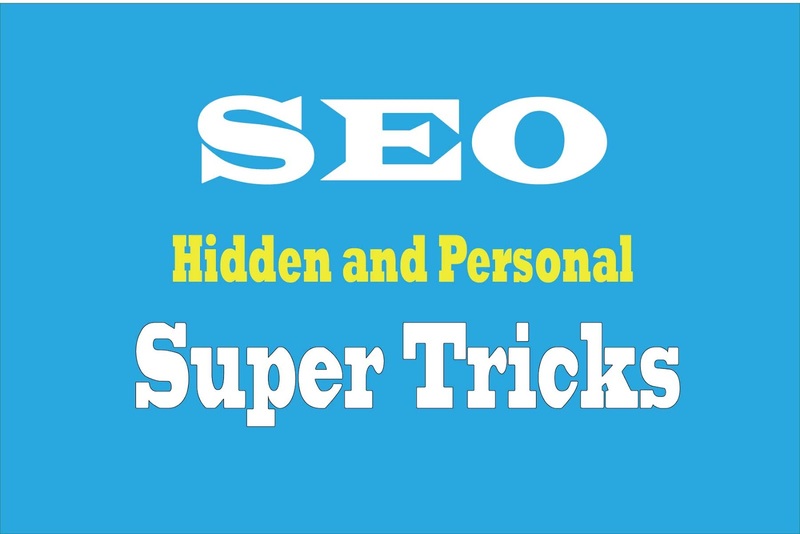 Here some of the most hidden, personal and super SEO tips and tricks with awesome description. 1. Meta title length should be about 70 characters. But not above 70 characters. 2. Meta description length should be about 160 characters but not exceed 160 characters. 3. Most common keywords should be more than 30 but fewer than 50 in the whole website. 4. Most common keywords should be used in meta keywords tag. 5. Keywords cloud number should be as more as possible. 6. The whole website should be only one <h1> heading. 7. The whole website should less than 10 <h2> headings. Too many <h2> headings are treated as duplicate and spam by Google. 8. Upload a "robots.txt" file in your root directory. 9. Upload a "sitemap.xml" file in your root directory. 10. Avoid high number of links on a webpage. Each webpage should have less than 100 links but not any broken link. 11. All URL should be SEO friendly. 12. All image should have "alt" attribute. 13. Always avoid inline CSS styles. Use external CSS only. 14. Never use deprecated HTML tags. 15. Use latest version of Google analytics code. 16. Your website must have a favicon icon. 17. Websites should have no java script error. 18. Websites should be connected with all social media. 19. HTML page size should be as less as possible. 20. Webpage loading average time should be less than 5 second. 21. Reduce the number of plugins. 22. Use rel = "nofollow" carefully. Search engines will not crawl these links. 23. Never use noindex meta tag. 25. Website should be mobile friendly and responsive. 26. Use SSL certificate in website for https:// connection. 27. Use URL canonicalization. Example: http://www.ofuran.com and http://ofuran.com resolve to the same URL address. 28. Every webpage should have a doctype declaration. 29. Never use frame in webpage.